Our designs have not only to consider the clients’ wishes to ‘stretch their elbows’ but also the site constraints, planning authority and neighbouring owners’ issues which all inform the solution. So that our concept which started out as a simple box developed angular high level windows, sloping roofs and spiral staircases all in superimposition. Window placement was paramount: in this instance there was a sheer eight meter high brick boundary wall for most of the site’s northern side. 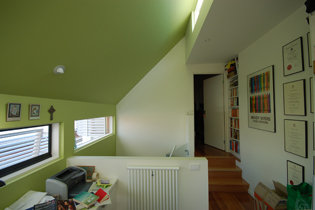 So going up was our best chance of grabbing some northern light for the living areas of the home. The clients are both academics and central to the project is the Study which embodies the idea of a study, not just as a separate room or a nook in a lounge or hallway, but as a whole place dedicated to higher thought. This place is at the top of the spiral stair case with its own private balcony and views across the rooftops of the inner suburbs. It’s a place to think and work during the day, alone but without isolation. This idea is ever more important to all of us today as our work habits vary and we often find our home is not just a retreat. We also like the way the spiral stair case echoes the form of the neighbouring Shot Tower, in fact some great views of the Tower can be had in transit! This design is a sensitive response to a difficult site and the solution does not suffer from having adapted to the height set back constraints. All of the new rooms/ spaces have access to high level ceilings and light. 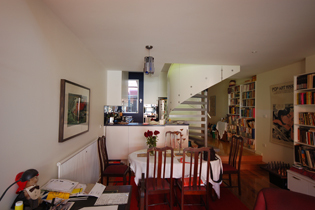 The spiral stair case over the kitchen is inspirational rather than restrictive and delineates the living room in an unusual but successful way which otherwise could have been a very dark area requiring artificial light to function.